We live in an interconnected world. If you're reading this, on the internet, then you're probably used to having access to an unlimited wealth of information – web sites where you can meet people with any conceivable interest, buy or sell practically anything, and look at pictures of cats. 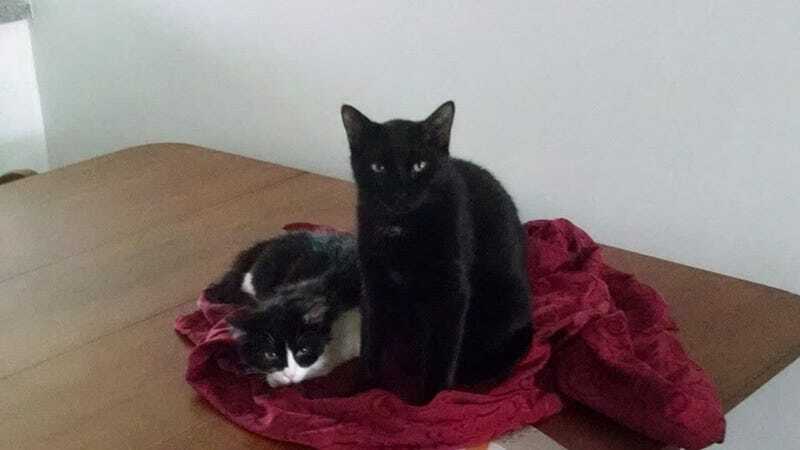 (These are mine –Lister, sitting up, and Kryten, being lazy.) Having recently had a middle aged birthday, I'm all too aware that them kids these days don't know a time before all the knowledge of human race was at their fingertips in their smartphones and tablets. So before I yell at you to get off my lawn, let me tell you how things used to be – and how the world eventually caught up with me. For as long as I can remember, my dad has been involved in amateur radio. I remember his poles supporting a long wire that went all the way across the backyard for an antenna I now know as an "inverted vee." I remember the tower he put up behind the new house when he moved, with all kinds of pipes stretching horizontally (which I now know was a triband Yagi antenna for the HF bands) and vertically (an antenna for the two meter band). And I remember his ham shack, with his Kenwood transceiver, with which he could pick up a microphone or use a Morse code key to talk to other ham radio operators, near and far. He had special postcards, called QSL cards, that he exchanged with people he talked to from literally all over the world as physical confirmation of their radio contacts. To most people at the time, this would be magic. It certainly was to any other children my age who I tried to explain it to. But for me, it was perfectly normal. My dad would spend a fair amount of time "chasing DX," or distant stations, just for fun. He'd make new friends with people he met on the air, and sometimes it would become a friendship in the real world. Most of these were local people, but for years he had a weekly "sked," or scheduled contact, with Sam in Spartanburg, SC. When we drove from Massachusetts to visit family in Florida some years, we'd stop and spend a night or two with Sam and his wife on the way. Meeting and staying in touch with friends by electronic means is something we all do today. But my dad has been doing this since the 1970s, and ham radio operators have been doing it for over 100 years. In fact, this year was the 100th anniversary of the American Radio Relay League, whose purpose is "To promote and advance the art, science and enjoyment of Amateur Radio." In recent times, the ARRL has referred to ham radio as "the original social networking." At first, it sounds like a cheesy catch phrase, marketing speak intended to make an ancient hobby seem remotely relevant to modern technology. But the funny thing is, it's absolutely true. In 1989 I passed my Novice license test (yes, you need a license to use amateur radio, unlike CB) at age 15 – before I could even drive. Six weeks later, I got that piece of paper in the mail from the FCC, issuing me the callsign KA1ULT and permitting me to get on the air myself. My dad had set up extra wire antennas and some of his old equipment in my room so that I could have my own fun on the air. I reached out and met all kinds of people around the country, and in other countries as well. I had two maps on my wall, one of the US and one of the world. When I contacted someone in a new location, I found them on the map and put a sticky dot there. Over time I had hundreds of dots on both maps. This, more than anything I learned in school, is how I learned geography. It's one thing to learn it for a test. It's quite another when you just spoke with Vladmir in Kyzyl, and want to know where he lives. And now I'm proud of my contacts in places like East Germany and the Soviet Union, which no longer exist as they did at the time. I've even made up my own QSL cards to exchange with people in far off lands. As a teenager, I got a lot of extra attention on the air, as most people I talked to were much older than me. In fact, I got even more when I told people my location was Harvard, Massachusetts. Of course they assumed I was at the university, but I actually lived in a small town with the same name about 30 miles west of Boston. (Even the Wikipedia article has to make that distinction.) But the wonderful thing about the radio community was that, although they were impressed I got my license so young, the important thing was that I was licensed, and not my age. Though I was not yet out of high school, I was accepted as an equal among peers for the first time in my life. When I went to college in western Massachusetts, my dad and I used ham radio to keep in touch, rather than paying for a phone line for me. I started making radio friends as soon as I arrived. My second day there, I was walking by the school bookstore, and a campus police officer called me over. So I did as he said. He told me to turn around, so I did so, slowly. I was scared – here I was, just arrived at college, and I was already in trouble with the cops! When I faced him again, he smiled, offered his hand, and said "Hi, I'm Steve, WA1WMN." He was looking at the callsign on the back of my jacket, not suspecting me of stealing from the bookstore! We became and remained friends throughout my time there, until he sadly passed away a year after I left. Keep in mind that all of this social networking was happening in the late 80s and early 90s. There was no Facebook. There wasn't even MySpace, LiveJournal, or any of that. The world wide web was in its infancy, and because my school only gave internet access to computer science majors at the time, I wasn't online. * It was my ham radio hobby that gave me this additional perspective outside of what was strictly related to my education that was rather unique at the time, but quite common today.